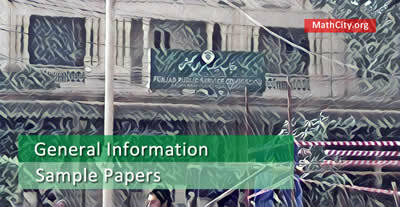 Our aim is to give general information, syllabus and paper pattern of paper couducted by Punjab Public Service Commission (PPSC) for the post of Lecturer in Mathematics. This page might be helpful for other jobs as subject specialist or for public service commission of other provinces. Please consider the subjects level to be MSc or BS in mathematics. One need to covered the following subjects without proofs but definition, examples and statements of the theorems with applications. Anton, H, Calculus: A New Horizon, Ed. 6, John Willey, New ppsc-mock-test-1-akhtar-abbasYork, 1999. Thomas, G. B. Finney. A. R., Calculus, Ed. 9, John Willey, New York, 2005. Yusuf, S.M. Amin. M., Calculus with Analytic Geometry, Ilmi Kitab Khana, Lahore. Zill, D. G. , Cullen, M.R., Differential Equations with Boundary Value Problems, Ed. 3. PWS Publishing Co., 1997. Abell, Braselton, Modem Differential Equations Ed. 2, Thomas Learning Inc. USA, 2001. Curchill, R.V., Brawn J.W., Complex Variables and Applications, Ed. 5, McGraw Hill, New York, 1989. Ghori, Q.K., Mechanics. Ilmi Kitab Khan, Lahore. Weather burn, C.E., Differential Geometry, The English Languages Book Society and Cambridge Uni. Press. 1964. Guggenheinerar, H.W., Differential Geometry, McGraw Hill, 1990.